There has always been one thing standing in the way of me cutting back on my consumptions of sweets. It is chocolate. If you are anything like me, chocolate is one of those things that I probably couldn’t live without. However, you don’t always have to feel guilty after eating chocolate. There are actually options for healthy chocolate bars. BIJA Chocolates Organic Dark Chocolate could be exactly the chocolate bar you are looking for. If you love chocolate as much as I do, finding that good tasting, yet healthy chocolate bar is your life dream. So the question is, is the BIJA Organic Dark Chocolate the one? Hopefully this review will be able to help you determine if that is the case. Over seven million tons of chocolate are consumed worldwide. That is an insane amount of chocolate. That means that it is likely that you ate around 2 pounds of chocolate last year. The chocolate we commonly eat is sugar heavy and diluted with tons of additives and sweeteners. That is what really makes chocolate so bad for you. BIJA Chocolates Organic Dark Chocolate is supposedly much better for you because it contains a high percent of cocoa. Another great thing about the BIJA Chocolates Organic Dark Chocolate is that each bar is made with only 4 ingredients or less. The problem is that when the cocoa content gets that high a chocolate bar usually gets extremely bitter and difficult to stomach. Luckily, I hear BIJA Chocolates Organic Dark Chocolate is actually pretty sweet. However, looking at the ingredients, it makes me wonder how much sugar is actually in the chocolate. It is possible that the extra ingredients in some of their bars are what really make the chocolate stand out. All of the ingredients in BIJA Chocolates Organic Dark Chocolate are completely organic and come from direct trade. BIJA definitely has a passion for the environment and has sourced the absolutely best ingredients possible for their chocolate. They also have a very simple chocolate bar, as it only has 4 ingredients or less. The best part about all of the ingredients in BIJA Chocolates Organic Dark Chocolate is that they are received through direct trade. BIJA takes care to make sure that each person involved in growing all of cocoa beans are paid fairly and equally. Cocoa butter is a great way to keep chocolate smooth and still use natural cocoa products. Cocoa butter is what helps Equal Exchange Organic Extreme Dark Chocolate be so sweet and smooth. This is the oil that is extracted form the cocoa bean that is separated from the solid coca materials. If you want chocolate to be a good snack, the first thing to remember is that you have to eat it in moderation. Even traditionally healthy snacks are not great if you eat too much. If you are seeking to have this chocolate to curb your cravings, then you’re in luck. BIJA Chocolates Organic Dark Chocolate is the perfect bar if you want to eat just a few squares and feel like that is the right amount. Dark chocolate is full of a lot of really good nutrients to support healthy immune and circulatory systems. But if you eat too much, the sugar will outweigh the benefit of the nutrients. Other ingredients such as the high density of cocoa, help prevent heart disease. However, these benefits can only come from a really dark chocolate with a high density of cocoa. BIJA Chocolates Organic Dark Chocolate is all about making a high quality and healthy chocolate. They only add a maximum of 2 organic ingredients to their organic chocolate ingredients to make each chocolate bar. These are organic cane sugar and another random ingredient to flavor the bar. Both ingredients take away from the bitterness of the cocoa and help to create a smooth and sweet flavor that is much better tasting than the bitter flavor of regular dark chocolate. Many people really like the BIJA Chocolates Organic Dark Chocolate Classic Bundle. In fact so many people like it, you may be hard pressed to find one of these bundles available. A lot of reviews say that it is the very best chocolate that they have ever had. Any of the negative reviews don’t have anything to do with the chocolate. Almost all of the negative reviews are about the price. Each bar costs around 5 dollars. There are a lot of things to take into consideration with that price. First is the quality of the ingredients. BIJA Chocolates Organic Dark Chocolate is made with only the highest quality ingredients. Second is the fact that each BIJA Chocolates product purchased helps fund their varying projects around the world to build up the economies of the growers. BIJA Chocolates is a company dedicated to the equal rights and fair treatment of cocoa bean farms and processing facilities. They are a company that is headquartered in Bellingham Washington. The company spends a lot of their time trying to raise awareness of the bad conditions that cocoa bean growers live through. They are under paid and work laborious, long hours. They believe that as they work with women’s cooperation groups that they will be able to help change the working conditions for chocolate growers around the world. Empowering women and providing them with knowledge is what they think will be the key. 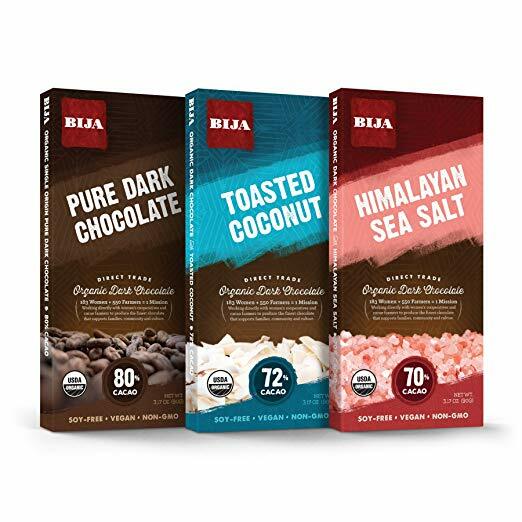 The BIJA Chocolates Organic Dark Chocolate Classic Bundle is a great snack that will help you get that chocolate fix without making you feel guilty about breaking your diet. This chocolate bar also tastes sweeter than most other dark chocolates that contain the same percentage of cocoa. Dark chocolate also is great for your heart, brain, and circulatory system as long as it is taken in moderation. Well, because this is chocolate, there aren’t that many cons. Chocolate is delicious. However, the price may be more than you would like to pay for chocolate. It is possible, though rare, to receive the wrong product in the mail. Make sure you are checking that you have clicked everything correctly before you submit your order. BIJA Chocolates Organic Dark Chocolate is a great product from an, ethically, very cool company. This is the exclusive chocolate bar of a lot customers because they have not been able to find one that they liked more. The price is more expensive than a regular store-bought brand, but the quality and morality of BIJA Chocolates Organic Dark Chocolate makes that little bit extra feel like it went a long way. If you decide you don't want to buy a chocolate bar for five dollars, make sure to check out the other healthy chocolate options here on green and growing. If you do like what BIJA Chocolates stands for, however, you should buy the BIJA Chocolates Organic Dark Chocolate Classic Bundle to try out sevral different and delicious options that BIJA Chocolates has to offer. Here are some top questions that I found for people seriously considering buying the BIJA Chocolates Organic Dark Chocolate Classic Bundle. How many chocolate bars come in this pack? There are 3 chocolate bars contained in the classic bundle. Is this product vegan? Yes! There are no animal products or byproducts in Bija Chocolates.